When I heard that the classic Ninja arcade game was about to be released on XBox Live, I had visions of Lode Runners and other classic games receiving a 21st century facelift. Unfortunately I was wrong, however my disappointment didn’t last too long once I got back into this game. It should be noted that this game is a direct copy from the SEGA Arcade pack which was released several months ago and with some clever advertising, a variety of other SEGA arcade classics are available, for a nominal cost of 400 points. Okay… enough with the geekiness and reminiscing, the second coming of Shinobi is here. With elements taken from a variety of “bad” yet memorable Ninja movies of the 80’s such as American Ninja, the gamer plays ninja Shinobi, AKA Joe Musashi who must free a group of kidnapped children from the Oboro clan, thanks to the nefarious criminal organisation called Zeed. Easier said than done but fortunately you have access to an unlimited of Shurikens (Ninja stars), a sword for close encounters, an UZI and limited Ninja magic that can be used to dispatch all your foes on screen. 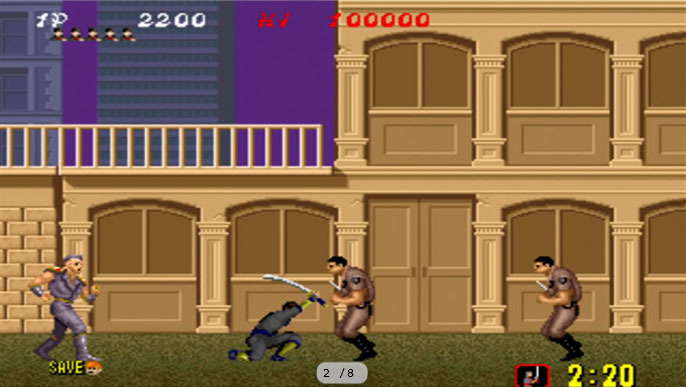 Shinobi is a classic side scrolling game that allows the player to jump, duck and fight the enemy. As with all good arcade games of this era, if you are killed, you will need to restart from the start of the mission and yes this can be painful for not only Joe but the gamer as well. The game contains five missions that are broken up into submissions and include a variety of different environments from the city, forest and the dangerous headquarters of Zeed. 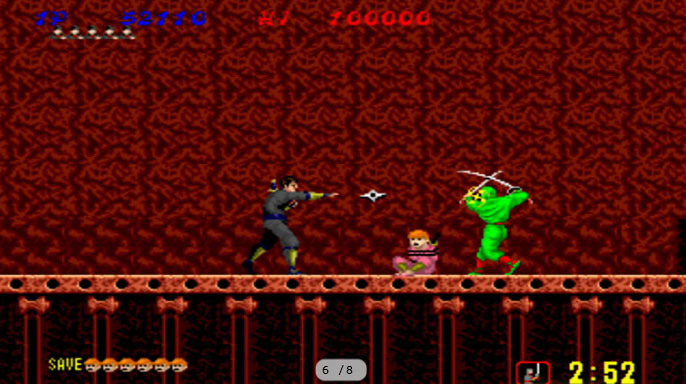 After each mission, you encounter a boss character such as the Robotic-esq Ninja of the first mission, a helicopter on the next or the grandmaster Zeed himself who has the ability to split himself to give Joe some added grief. On each level, you need to rescue a set amount of children who are being guarded by a variety of enemies. Standard guards with guns require one shot to kill, whereas the various coloured Ninjas in the game take a little bit more to dispatch. When you do acquire the UZI, they generally dispatch most enemies with one shot, accept for bosses. Between in mission, there is a bonus stage where you need to dispatch running Ninja’s with your Shurikens and if you succeed, you are awarded a bonus life. On the XBox Live version of Shinobi, you can set the difficulty and amount of lives that are at your disposal plus you have the ability to save, just like the SEGA Arcade classic pack. Control wise, it’s not bad on the 360 controller, however nothing beats that classic arcade stick and buttons. At times, the controls on the 360 can be quite frustratingly fiddle some. As this is an XBox Live game, the title allows you to record your achievements and scores on the leader boards and I’m still working on it to be number one. Fancy some two player fun? The game supports local multiplayer just the like original console. Graphically, the title was quite impressive at the time with colourful bitmapped environments and even some special effects here and there. Even now, the game has dated well and oozes with classic arcade eye candy goodness. The music for me anyway has always been quite memorable and hearing the theme again only brought back good memories. This was one of the few games of the time to have some digitised voices such as “Mission Completed” or the sounds of Joe using his Ninja magic. Quite cool during it’s heyday. Even though I was hoping to keep this review short, the game is still cool for school. Shinobi spawned a variety of other Ninja inspired games during the 80’s and hopefully we will see some of these on XBox Live. It would have been nice if this was remade with 21st century graphics but even so, this is one classic game that comes recommended by Impulse Gamer.